We do not recover alone. The Shedoesthecity x She Recovers Recovering Out Loud event welcomes all to an evening where women in recovery for alcoholism, addiction, and other life challenges, will share their stories, insights and wisdom about what recovery looks like to them. You do not need to identify as an alcoholic or addict to attend this event; as the She Recovers philosophy states, we’re all recovering from something. 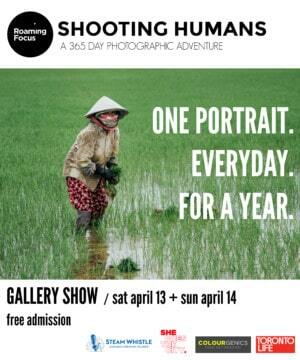 Come to listen, learn and question, and leave with the inspiration to create, modify or further your own journey. Award-winning journalist Ann Dowsett Johnston was my sponsor in recovery. I was interviewed for her book and was a subject in the CBC documentary Girls’ Night Out, which was inspired by her bestselling novel, DRINK. She is a powerhouse speaker with a wealth of well-researched knowledge on the subject of women and alcohol. When I was in my first year of recovery, I walked into a church basement and heard Jowita Bydlowska share her story – what life was like then, what happened to her, and how her life changed. I didn’t know that a few years later I’d be sitting across from Jowita in the offices of Penguin Random House, interviewing her about her bestselling memoir, Drunk Mom. Reading Jowita’s book cracked something open in me: I threw it against the wall, I screamed, I cried. And I got really scared about being a mom. Her book helped keep me sober. In the rooms of recovery, I have listened to Nanook Fareal share her story several times, and I’ve watched how she’s dramatically transformed her life into something truly beautiful. For over a year, Nanook struggled with homelessness. Since then, she has turned her life around, and her heartfelt activism has led her to support Indigenous families throughout Northern Ontario and Nunavut through Feeding Canada, an organization she established to fight unjust food prices. Watching her journey over the years has been incredibly inspiring. Last spring, I attended She Recovers NYC on my own and sat in a room with 500 women in recovery; I knew one of them. Amongst the dozens of friendships I formed, I met She Recovers co-founders Taryn Strong and Dawn Nickel, the mother and daughter from Victoria, BC, who have built a community for women in recovery with over 260,000 members. The conference blew my mind, and when I went to thank them at the end, I found myself crumbling and crying in Dawn’s arms. Our paths crossed at a turning point in my recovery; or perhaps they were the ones who presented the turning point – I’m not sure. But the She Recovers conference was special and unlike anything I had ever experienced. I knew I wanted to share a bit of what I discovered with the women in Toronto, but at that point, I wasn’t sure how. Since that conference, I have stayed connected with many of the women I met. Olivia Pennelle, who is located in Portland, Oregon, is one of them. Olivia is the creator and managing editor of Liv’s Recovery Kitchen and has written about recovery for numerous publications including The Fix, Recovery.org, Tranformation-Is-Real. Sitting together at a dinner, we chatted about the oddly shaped dessert, but we quickly cut through the niceties and spoke candidly about our personal afflictions and challenging life moments. Through honest sharing, a whip-smart sense of humour and a curious nature, Olivia does a superb job at starting important conversations about recovery that challenge the status quo in a fresh and non-judgemental way. Ann, Jowita, Nanook, Taryn, Olivia, Dawn: these women have been integral to my sobriety, to my recovery, to my journey. And there are dozens of other women who have played important roles. In my experience, I have found that shame, isolation, secrecy and negativity are what prevent us from living our truths in a confident and joyous way. When you stop fighting addiction on your own, you realize there is a web of support that is so tightly woven – so strong – that if you lean into it, it will hold you. On Friday November 19th, all of us (minus Dawn, who will be there in spirit) will be sharing parts of our stories: what our journeys looked like at the beginning, how we’ve changed, where we’re at today, and what we’ve learned along the way. Following, Taryn will be leading an open meeting for women in recovery for substance abuse and other life challenges. I chose to partner with She Recovers because I believe they are approaching recovery with a fresh lens and have built a philosophy of recovery that is revolutionary. I want to build on what they’re doing and share with as many women as possible. We’re stronger together. 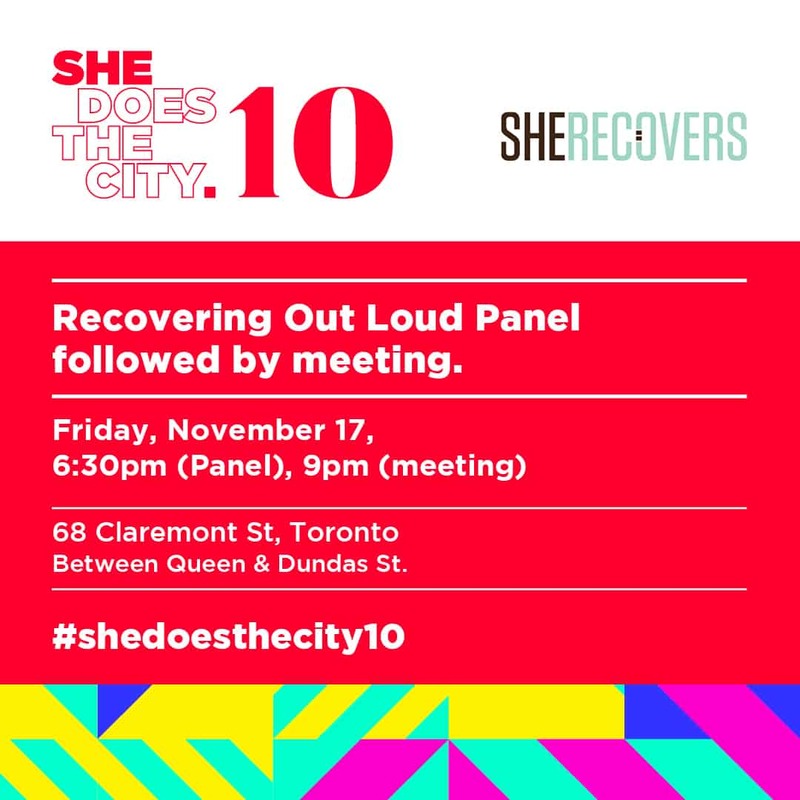 Shedoesthecity x She Recovers Recovering Out Loud Panel is taking place Friday, Nov 17th, 6:30 – 8:30pm at 68 Claremont Street. Complimentary tea service provided by Pluck Teas, complimentary coffee from Reunion Island Coffee, and yummy cookies courtesy of the Drake Commissary. RSVP here.